Pensioned stallion Cherokee Run has been euthanized due to declining health. 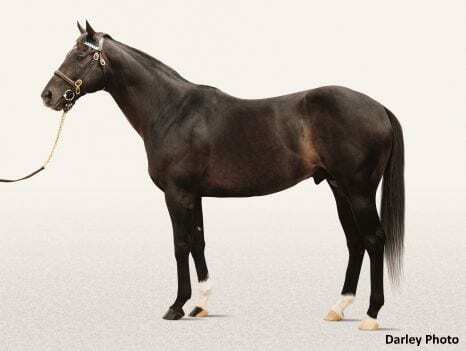 Cherokee Run entered stud at Jonabell Farm in 1996, then owned by the Bell family and stood as a Darley stallion after the farm was purchased in 2001 by Sheikh Mohammed. Cherokee Run was represented by 53 career Stakes winners, including Champions and G1 winners War Pass and Chilukki. His 16 other Graded or Group winners included Sean Avery, who became his sire's last Graded winner with victory in the G1 Alfred G. Vanderbilt Handicap in 2011. Cherokee Run's progeny have earned almost $55 million to date. War Pass and Chilukki were both Champion two-year-olds, with War Pass voted the top juvenile male of 2007 after winning both the G1 Breeders' Cup Juvenile and the G1 Champagne Stakes. Chilukki won her Eclipse Award after winning the G1 Vinery Del Mar Debutante and G1 Oak Leaf Stakes. She also finished in that year's G1 Breeders' Cup Juvenile Fillies'. Bred in Florida by George C. Onett, Cherokee Run was by Runaway Groom out of the Silver Saber mare Cherokee Dame. He raced in the colors of Jill Robinson, winning on 13 occasions and earning $1,531,818. Both Frank Alexander and Frank Gomez trained him during his career. Cherokee Run won the G1 Breeders' Cup Sprint in 1994 and also was victorious in the G2 Frank J. De Francis Memorial Dash Stakes, wins that were instrumental in him being named Champion sprinter that year. Although his greatest strength was in sprint races, he also ran a creditable second in the 1993 Preakness Stakes. Cherokee Run won four other Stakes races during his career and was also placed in the G1 Metropolitan Handicap, G1 Carter Handicap and the G1 Vosburgh Stakes. This entry was posted in Bloodstock and tagged breeders' cup sprint, cherokee run, chilukki, darley, jimmy bell, jonabell farm, runaway groom, sean avery, sheikh mohammed, war pass by Press Release. Bookmark the permalink.